The Connacht Under 18 Girls produced a brilliant performance on Sunday to defeat Munster and make it two wins from two in the Under 18 Girls Interprovincial Series. The opening quarter saw Munster dominate much of the possession and territory, and the pressure eventually told when a quick tap penalty saw them touch down in the corner and a 5-0 lead. That immediately sparked a resurgence in the Connacht camp, and they got a crucial score just before half-time when Beibhinn Parsons got her first of three tries, showing her lightning pace to set-up an easy conversion opportunity for Meabh Deely which made it 7-5 to Connacht at the break. 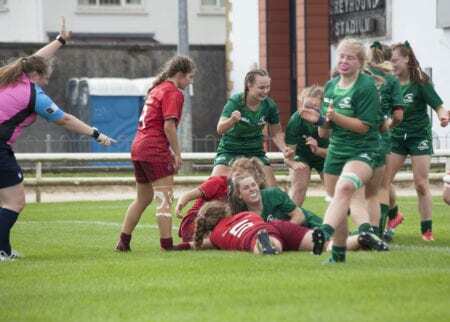 Connacht’s under 18 Girls Team conclude their 2018 Interprovincial Series against Leinster on Saturday, 15th September. Kick-off at Barnhall RFC is 2.45pm.